Thank you for visiting the official Vichy website.To ensure your Vichy products are authentic please purchase through one of the destinations listed in our Store Locator or authorized online retailers listed below. Please be aware that if you purchase from an institution not listed as authorized the product(s) may be diluted, expired or counterfeit. They may not be safe to use or perform as tested and Vichy will not take any responsibility for the purchasers dissatisfaction. Diversion is when products are sold in "unauthorized" places. For example, all genuine Vichy are sold exclusively through authorized Vichy skincare professional partners. Vichy products that you find outside of these places are considered to be "diverted". Diverted products can be counterfeit, diluted formulas, or old, expired formulas that may not be safe to use. 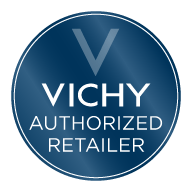 This means if you buy our products from any other outlet other than authorized Vichy skincare professional partners, we cannot guarantee that they are authentic (Vichy products that will perform as tested).